Descend into the nerve-shattering realm of America’s master of horror, H. P. Lovecraft—to a dank place where gloomy maelstroms await the unwary, where the unnatural is surpassed only by the unspeakable, and where all pleasure is perverse. Take a chance. . . . All you can lose is your sanity. The Doom That Came to Sarnath—The magnificent city had wealth beyond measure, but no riches could save it from a ghastly day of reckoning. The Shunned House—He vowed to rid the odious structure of the brooding horror that clung to it, but evil would not go gently. The Dream Quest of Unknown Kadath—Desperate to understand his tormenting vision, one man begins a forbidden and nightmarish journey. The Tomb—The old Hyde family crypt held a gruesome attraction for a boy, until he communed with the dead and learned their secrets. The Shadow Out of Time—The quest to understand the devouring force that once possessed a scholar leads a man to the other side of the world, where all will be revealed in one hideous, unholy night. Shadows of Death. By H.P. 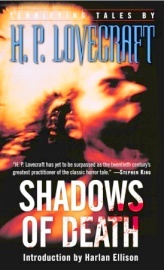 Lovecraft, with an Introduction by Harlan Ellison. New York, NY: Del Rey; 25 October 2005; ISBN 0-345-48333-2; Paperback; 336 pages.